These aren’t your grandma’s greens, ya’ll. 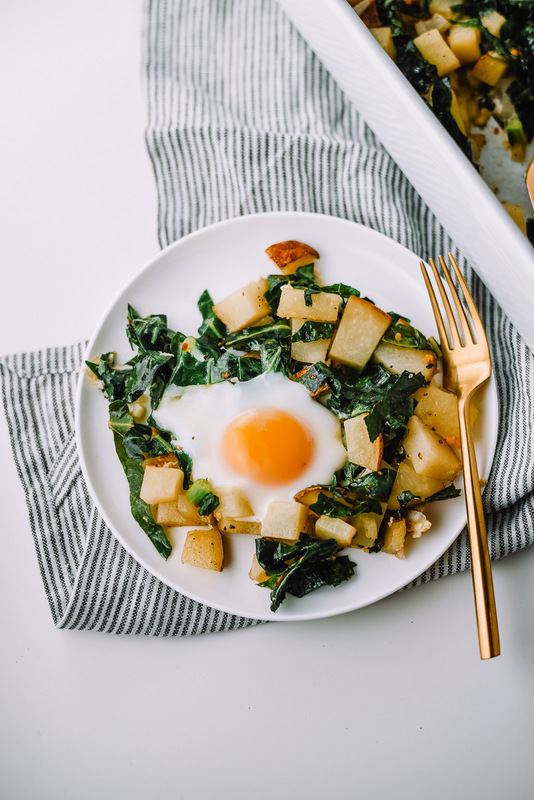 I’m back with a new recipe but this time I’ve partnered with Nature’s Greens to make A Fried Eggs, Collard Greens, and Potato Hash! It’s time to take a break from kale and focus on other excellent leafy greens for a change. Better yet, it’s time to go back to the foods that were a staple of my upbringing and find new ways to enjoy them. 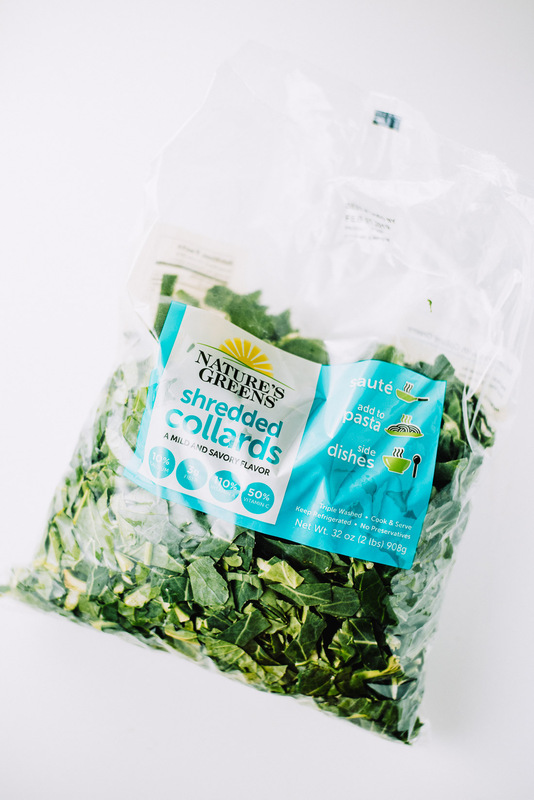 My earliest memory of eating collard greens was with my grandmother back home in Florida. We would go to the local grocery store and buy a bushel. I loved to help soak them in the sink to clean. In my house greens were cooked with some type of meat, usually smoked neck bones. It really doesn’t get more southern than that! 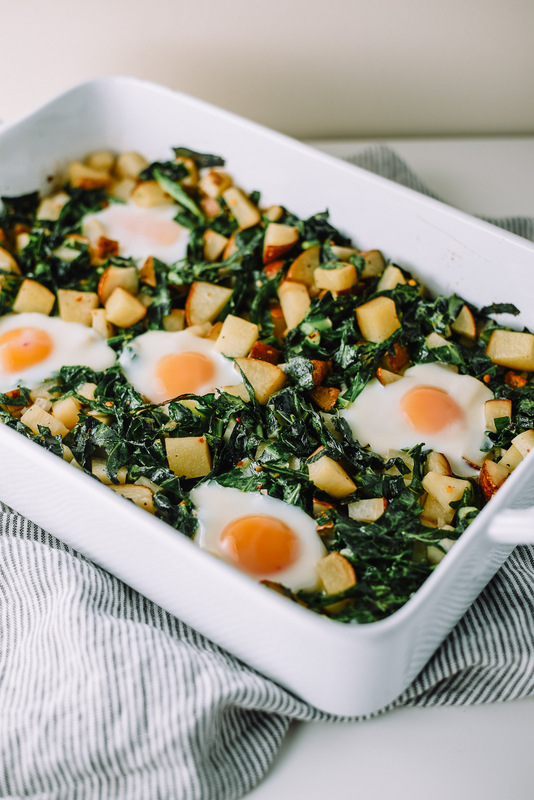 But collard greens are more than just a side dish. They can be used in soups, pastas, and wraps. Pre-heat oven to 400 degrees. While oven pre-heats start prepping your onions and potatoes. To minimize browning place cut potatoes in room temperature water until ready to cook. In a large bowl combine onion, potato, garlic, salt, pepper and mix well. Add to baking pan and cook in over for 15 minutes. While cooking prep collard greens, drizzle 1 tbsp of olive oil, salt, pepper and set aside. Remove pan from oven. Season collard green with salt, pepper, and red pepper flakes and mix with potatos/onion/garlic. Place back in oven for another 5 minutes (stirring occasionally). Lastly, remove pan from oven. Create 5 wells (holes) to make space for eggs. Crack open eggs and place one egg in each well. Return pan to oven one last time and cook for 6-8 minutes or until egg white are set but yolk should still be runny. Preheat oven to 400 degrees. Dice onions into small pieces and set aside. Wash and cut potatoes into small pieces. In a large bowl combine onion, 3 tbsp olive oil, potatoes, garlic, salt, red pepper flakes, and pepper. Spread potato mix along the bottom of 9×13 baking dish. Cook in oven for about 15 minutes. Remove. Next season shredded collard greens with salt and pepper. Add 3 tbsp olive oil. Mix collard greens and add to pan. 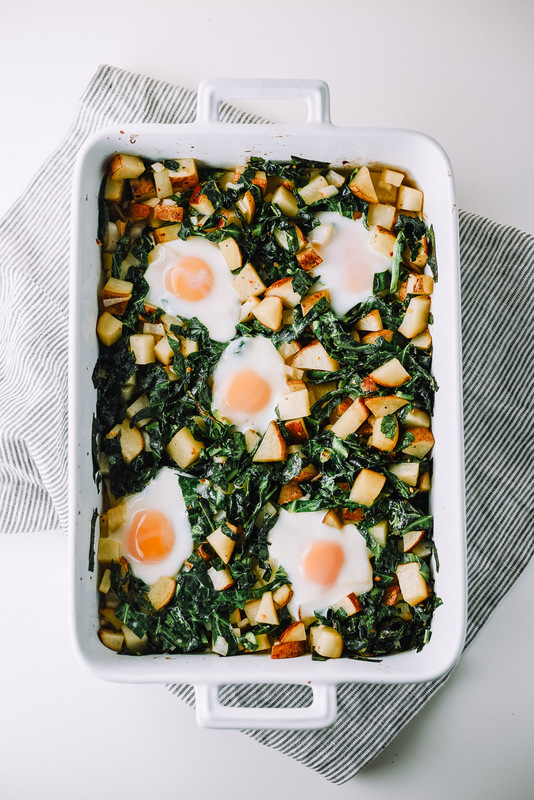 Toss collard greens with potatoes. Place back in oven and cook for another 5 minutes. Lastly, remove dish from oven. Create 5 wells to make space for eggs. Crack open eggs and place one egg in each well. Cook for 6-8 minutes or until egg whites are set but yolk should still be runny. This post is sponsored by WP Rawl.